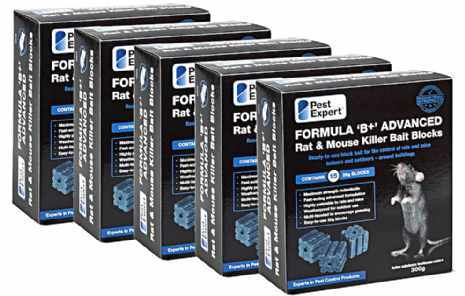 These premium-grade Mouse Poison Bait Blocks are a highly effective and fast-acting mouse killer, formulated with maximum strength Brodifacoum to ensure optimal results. These top quality Pest Expert Mouse Bait Blocks contain the maximum concentration (0.0029%) of the powerful rodenticide, Brodifacoum for outstanding results. The formulation is so effective that a single feed is often enough to kill a mouse outright. These poison blocks are made from a wax-free blend of food-grade ingredients to increase palatability, and have been designed to provide mice with multiple gnawing surfaces, which increases bait uptake, helping to achieve rapid control of a mouse infestation in your home or business. As well as being ideal for indoor use, as these blocks are weatherproof, they are also perfect for outdoor baiting. Place bait where there are signs of rodent activity like fresh droppings, inside or near nests and burrows, runways and rodent feeding places. Place bait points throughout the infested area. It is generally much more efficient to use a larger number of small bait points compared to a smaller number of large bait points. Large bait points increase the risk to wildlife and to other non-target animals. For mouse infestations: Use bait points of 20g (1 block). Place bait points 5m apart reducing to 2m in high infestations. Mice are very inquisitive and it may help the control program to move baits every 2-3 days at the time when bait points are inspected and/or topped up. When using outdoors or in sensitive areas these Mouse Bait Blocks should always be housed securely within our lockable Mouse Bait Boxes to ensure they are inaccessible to children, pets and non-target wildlife. For the best value for money, please see our Mouse Poison Kits, which include both Mouse Bait Blocks and Pest Expert Formula 'B' Mouse Killer Poison along with Mouse Bait Boxes and Bait Trays. All our rodent kits are supplied with a professional advice sheet to help you carry out a successful mouse control treatment. Have ordered many times, fast delivery and great products - the best poison blocks I've used! Placed the order, the order got delivered, put the blocks out, the mice ate them, the mice died! Second to none service! Just fantastic! Cleared up our moderate mouse infestation rapidly! Highly recommended!